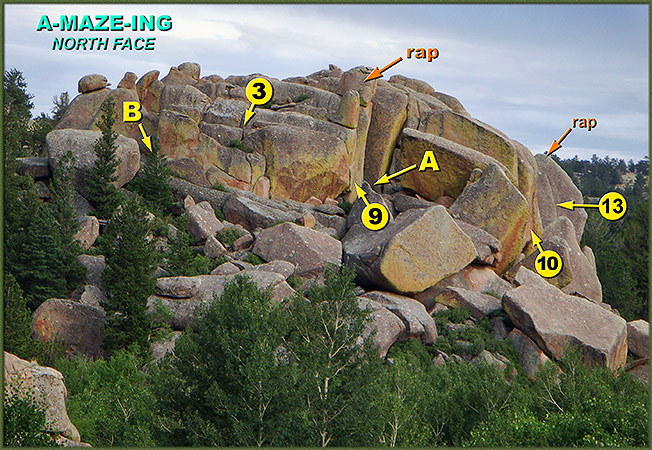 Upon first view, this crag seems like a ‘jumbled pile’, a MAZE of upturned flakes and blocks with little or no organization, nothing climbable, and in fact it was passed by on many occasions. 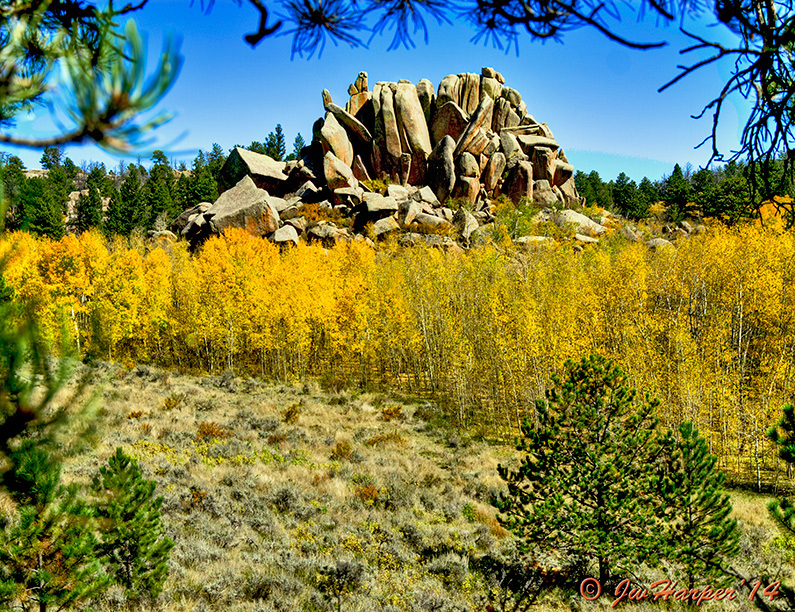 It is nestled in a pristine setting, a small remote valley choked with lush stands of pine and aspen groves with Crow Creek running nearby. Besides the gurgling of the stream, there is no noise except the occasional cry of birds floating on thermals overhead. It is untrammeled. And as it was explored in more detail over time, its organization became more apparent and very surprising. The structure is literally split apart by a labyrinth of ‘hallways’, a MAZE which separates all the components. 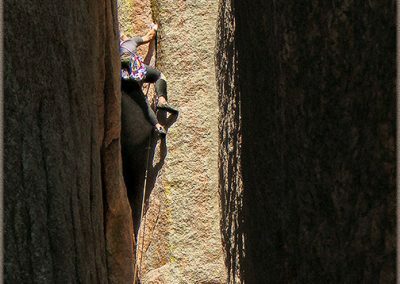 Not only did it become captivating to solve this strange natural puzzle, it also seemed there were many very unique opportunities to climb here – which we did over the next few years. from the INSIDE OUT !! *NOTE: All routes detailed here were first put up by Skip Harper and various partners (Luebben, Thomas, Johnson, Lossner, Edwards, etc.) between 1994 and 2008. *Important: P L E A S E R E M E M B E R !! 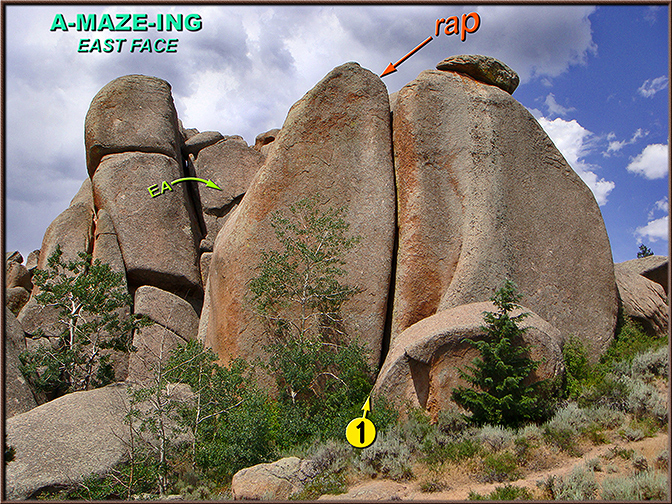 Many of these routes have seen only one or two ascents. The grading and route conditions will reflect this. The rock is rough and the grades might be imprecise. Both will most likely change to one degree or another over time. Given reasonable degrees of freedom, this place does show order. There are 4 major faces, North, East, West, and South, and a crisscrossing network of “hallways” is found throughout the interior. There are two principal Hallways, one with an entrance at ‘A’ and one at ‘B’ – shown in Figure 1, a composite showing all features in one image. Hallway A is more extensive while B constricts down within a short distance, allowing less ingress. This is shown in Figure 2. 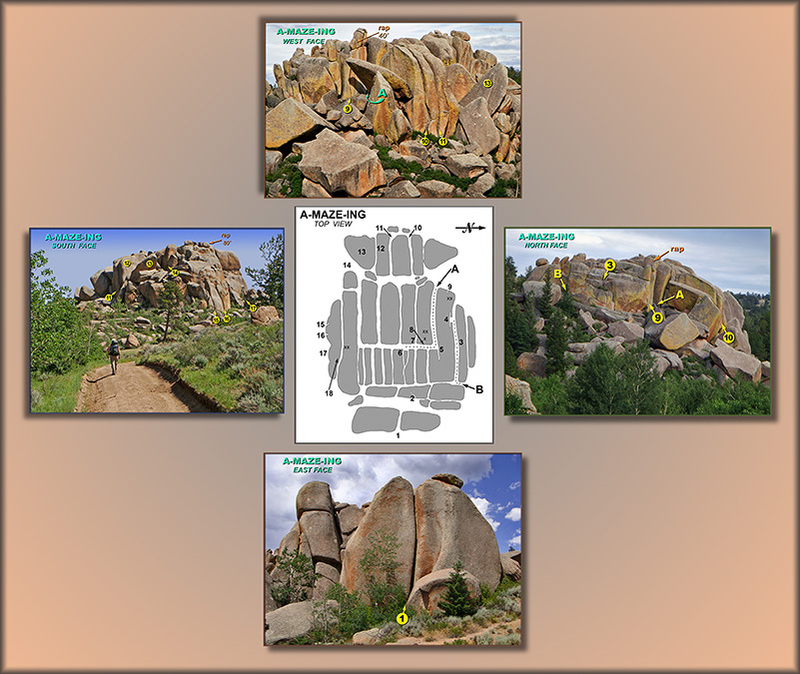 Each of these ‘areas’ is treated separately with more detail. Get to each by clicking on the appropriate link. A = Entrance to Hallway A and routes therein. B = Entrance to Hallway B and routes therein. FIGURE 2. Sense out of Chaos – A view from ‘the top’. 15. 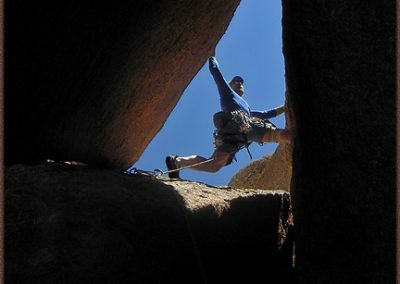 Dirty Reflection ~5.9+ Opens with jamcrack and heads ‘straight up’ to the top. 16. On the Other Side ~10a/b Opens with jamcrack and heads ‘straight up’ to the top. 17. 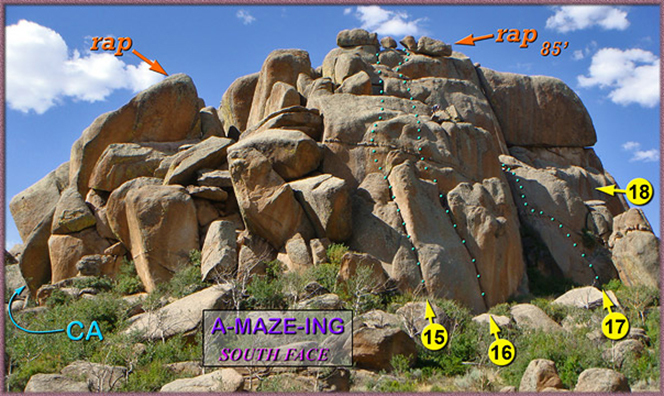 All Mixed Up ~5.9+ Mostly 5.7-5.8 Handcrack to dike traverse and up exposed face. 18. 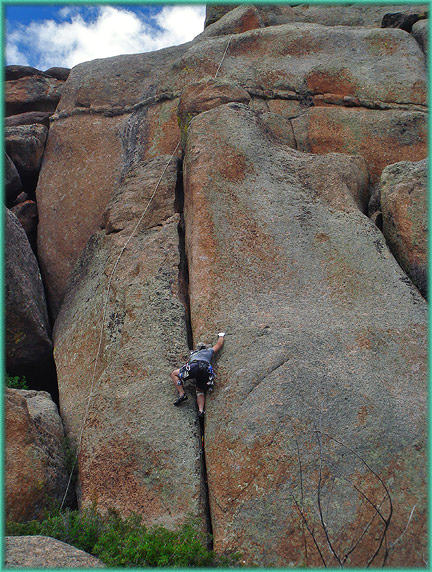 Goin’ Topside 5.6 to 5.8 Recreational variations that join #16 to finish. 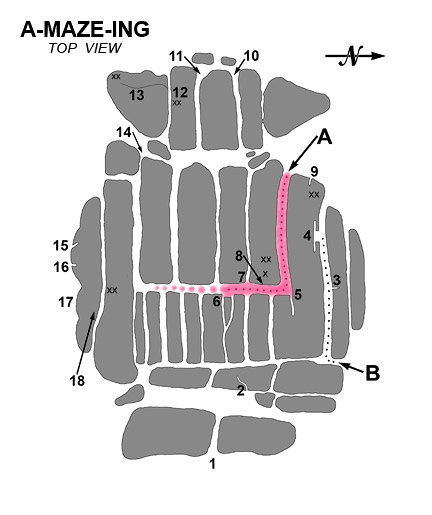 The EAST APSE (‘EA’): To get here, either go low, under route #1 and crawl westward between the two gigantic blocks. OR circle north around the big blocks and find a ‘passageway’ directly behind them. *See top figure for location (to EA). 2. Sweet Nothings inside in the East Apse, great hand crack on W. Face. *NOTE: multiple grades! 5.6 perfect hands but far too short, belay after the hand crack on gear and/or climb to top ( *NOTE: about 15’ of 5.9 runout face, will partly protect with thin wires). Belay on gear. Both short pitches can be combined. 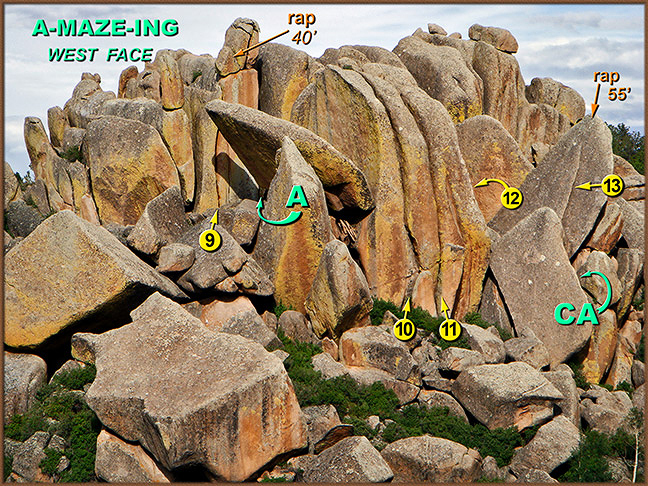 Scramble to any top anchor, ‘A’ is most convenient. (Harper and Edwards,’05). – Locations of Routes 3, 9, 10, 13 covered in detail in West Face. 9.) Befuddled 10c/d Hand jamming, stacking and lots of stamina will get you to the top. Short and stout, but typical Vedauwoo = tape! Big pro (incl. 2 x #3 1/2 cams). 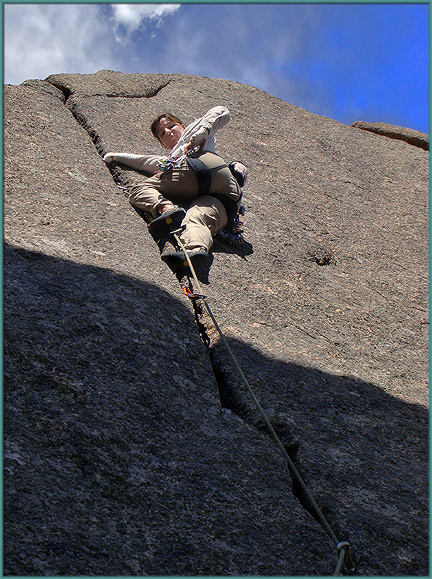 Belay and Descend using ‘A’ anchors directly above climb. (Luebben and Harper,’99). 11.) Malicious 10c/d Same description as #10 Belay on gear. Same descent as #10. Four routes exist here at present. 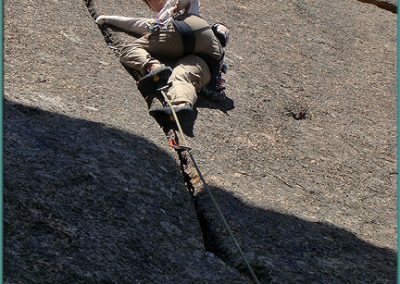 All belay on gear and descend from south Anchors. 18.) Goin’ Topside 5.6 to 5.8 A mixture of easier lines leading to the top. Take your choice of line. Short rack thru #3 Camalot. 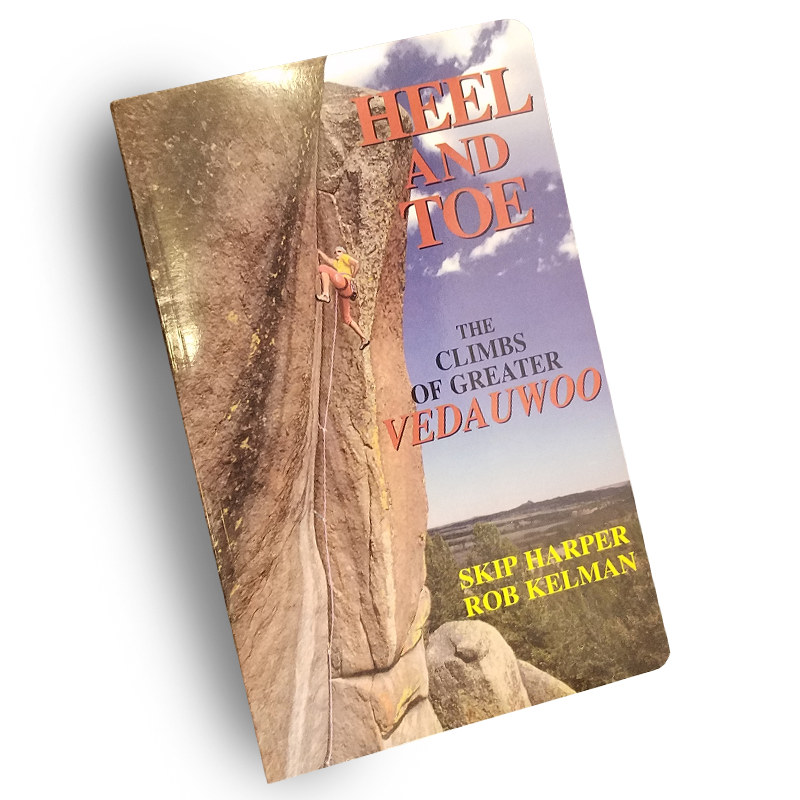 First soloed on a whim to get to the top in 1994. (Harper and Schmidt, ’94). Hallway A is shown in the schematic to the right (Fig. 1). To get there, go to the North Side of the formation and find the Entrance as shown in Figure 2. 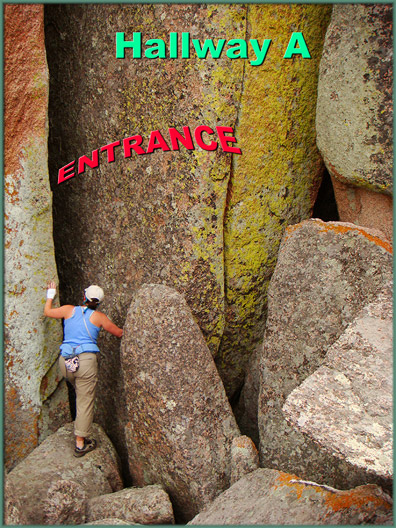 You will need to do a little ‘blind’ downclimbing to get in. Then proceed eastwards about 20 yards. 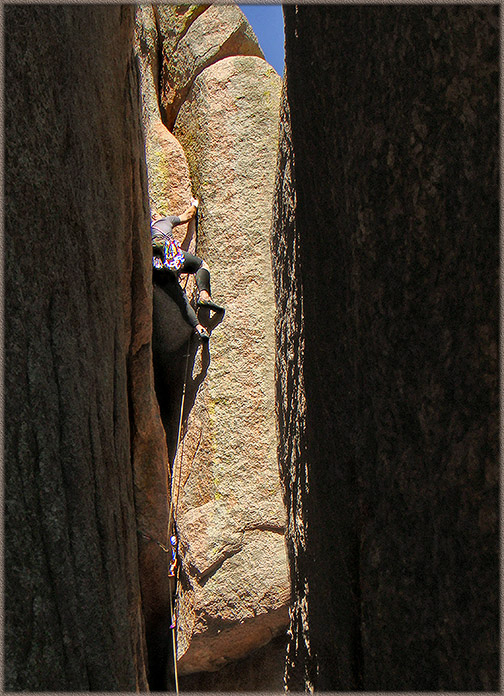 The going is easy until you reach the corner where the first obstacle is encountered… a small boulder. 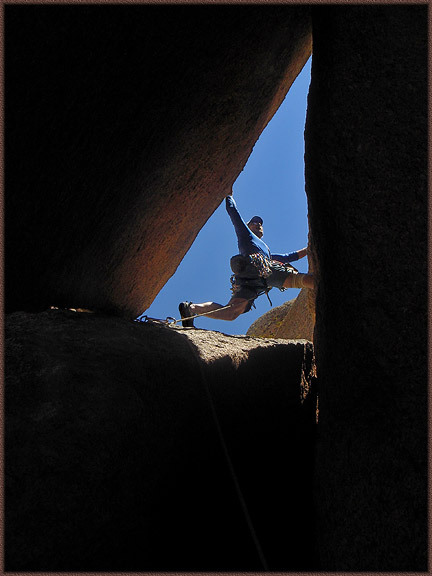 You are also looking straight at ‘Pandorra’s Box Has Cracked’, Route #5 on the schematic. 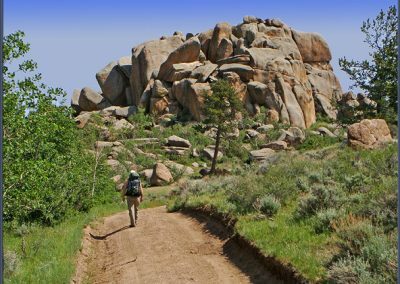 Go up and over the boulder to reach the base of the climb – or turn right and scramble up a larger boulder. Once on top of this second obstacle, it is suggested to lower to the ‘floor’ and you will be in the vicinity of Routes 6, 7 and 8. Hallway B is shown in the schematic above. 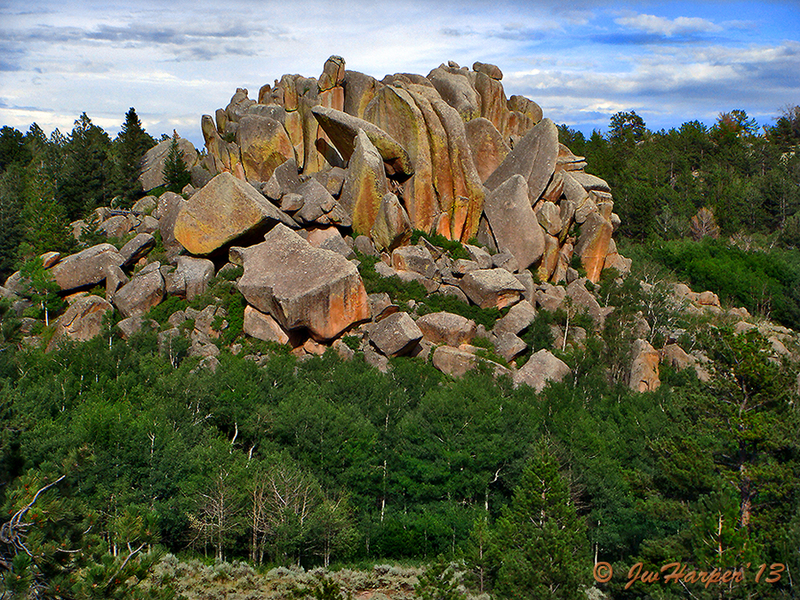 To get there, go to the North Side of the formation and find the Entrance as shown. You will need to negotiate an easy downclimb to get in and once there, make a right turn and proceed westwards. 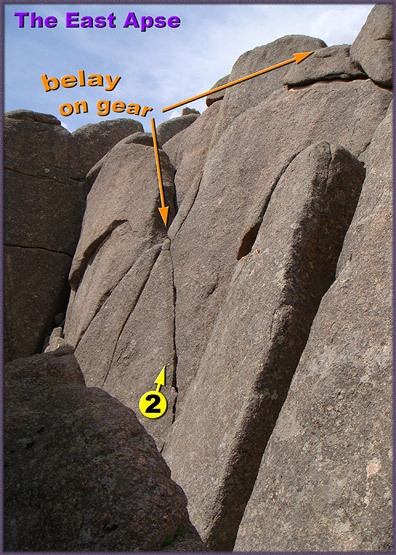 The first route you will encounter is #3, ‘Short Stuff’ on the right – and about 5 yards further on is ‘Mirror Images’ on the left. Descent is easiest using the “A” RAP Station.